Our Sunday school program offers children aged 3 to 6 a wonderful opportunity to experience the word of God at their level through story, music and crafts. The program runs year-round at the 9:00 a.m. Mass. The children process from the assembly at the beginning of Mass and return after the homily. Our dedicated volunteers provide a warm and welcoming environment where young children can joyfully encounter their Lord. "Why did Jesus say, ‘Let the little children come to me’?" At one point during Jesus’ earthly ministry, some children were brought to Him so that He could lay hands on them and pray for them (Matthew 19:13). The disciples tried to turn the children away, but Jesus said, “Let the little children come to me, and do not hinder them, for the kingdom of heaven belongs to such as these” (verse 14). Mark 10:14 (KJV) adds that Jesus was “much displeased” with His disciples for their actions. He then blessed the children (Matthew 19:15). There are two potentially puzzling elements to this story. First, why did the disciples try to keep the children away from Jesus? Also, what did Jesus mean when he said, “Let the little children come to me . . . for the kingdom of heaven belongs to such as these”? 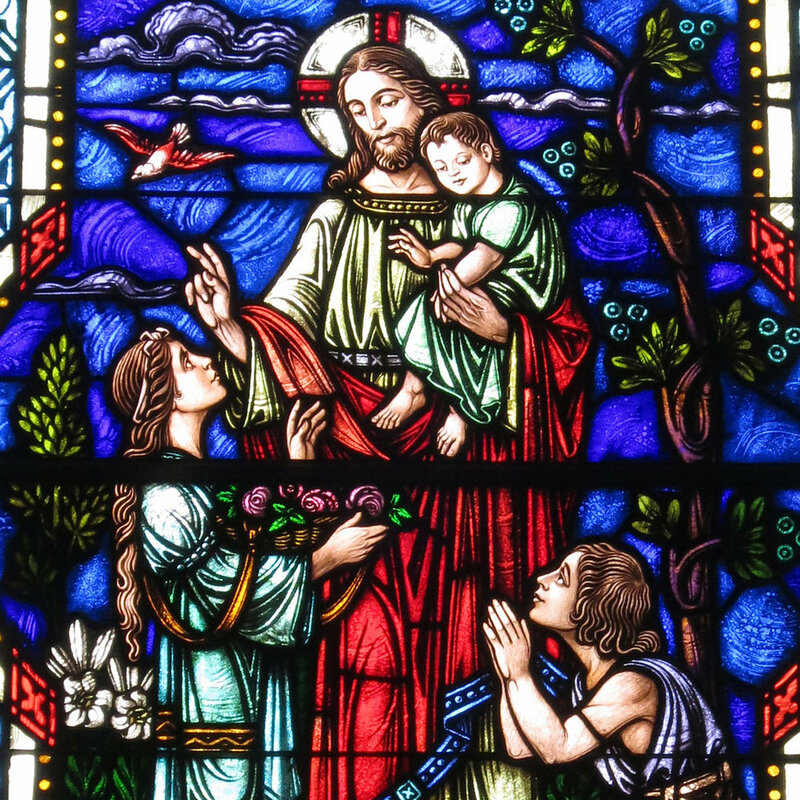 It is important to remember that children in Jesus’ time were not necessarily regarded as special or particularly endearing, except to their own parents. Many cultures today look on children as especially sweet, innocent, and even wise. Jewish culture in that day probably did not see children in such optimistic terms. The disciples most likely rebuked those bringing the children to Jesus because they felt bringing children to Jesus was socially improper or because they thought the children would bother Jesus. It is likely that their move to hinder the parents from bringing their children to Jesus was motivated not by unkindness but by a desire to respect Jesus’ position as a teacher. But Jesus wanted the children to come to Him. He said, “Let the children come,” because He wanted to bless them. It is wonderful to think of Jesus interacting with a child. Children are needy and dependent, and they know almost nothing about life. They function mostly on emotion rather than reason. Yet Jesus said, “The kingdom of heaven belongs to such as these” (Matthew 19:14). Scripture often compares believers to children (e.g., Luke 10:21; Galatians 4:19; 1 John 4:4). In fact, Jesus told those following Him, “Truly I tell you, unless you change and become like little children, you will never enter the kingdom of heaven. Therefore, whoever takes the lowly position of this child is the greatest in the kingdom of heaven” (Matthew 18:3–4; cf. Mark 10:15). Jesus’ command to “let the little children come to me” reveals several truths: 1) Children need to be blessed by the Lord. 2) The Lord wants to bless children. 3) Parents should be encouraged to bring their children to Jesus at an early age and teach them His ways. 4) Jesus has regard for the weakest and most vulnerable among us. 5) No matter how compassionate Jesus’ followers are, Jesus Himself is more compassionate still. 6) Those who come to Christ must do so in childlike humility, faith, and simplicity. Like children who implicitly trust their parents, believers trust God. Faith is not about knowing everything or doing everything right. It is about knowing that, no matter what happens, our Father will take care of us. That trust in Him, even when life is terrifying and sad and makes no sense, is what makes a believer like a child. “All those the Father gives me will come to me, and whoever comes to me I will never drive away” (John 6:37). God loves His children.